The MCP3008 is a low cost 8-channel 10-bit analog to digital converter. The precision of this ADC is similar to that of an Arduino Uno, and with 8 channels you can read quite a few analog signals from the Pi. This chip is a great option if you just need to read simple analog signals, like from a temperature or light sensor. If you need more precision or features, check out the ADS1x115 series on the next page. Before you use the MCP3008 it will help to skim this older Raspberry Pi MCP3008 guide for more information about using it with the Raspberry Pi. However don't use the code from the older guide as it's deprecated. This guide will show you an easier way to install and use new Python code to talk to the MCP3008 ADC. The MCP3008 datasheet is also an important resource to skim and have handy. 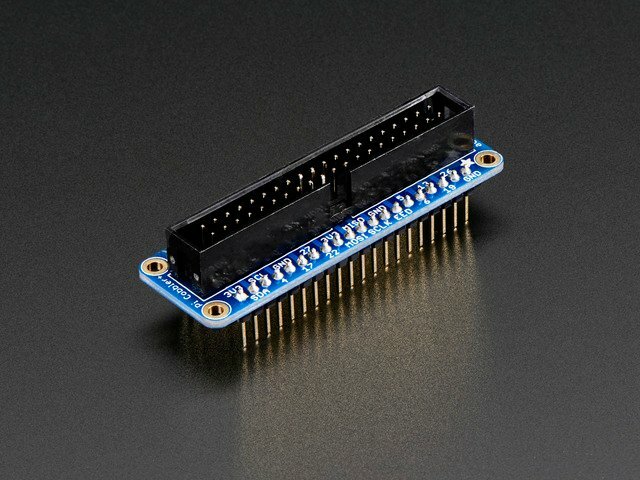 The MCP3008 connects to the Raspberry Pi using a SPI serial connection. You can use either the hardware SPI bus, or any four GPIO pins and software SPI to talk to the MCP3008. Software SPI is a little more flexible since it can work with any pins on the Pi, whereas hardware SPI is slightly faster but less flexible because it only works with specific pins. If you aren't sure which to use I recommend software SPI as it's easier to setup. Before you can wire the chip to the Pi you first need to place it into a breadboard. 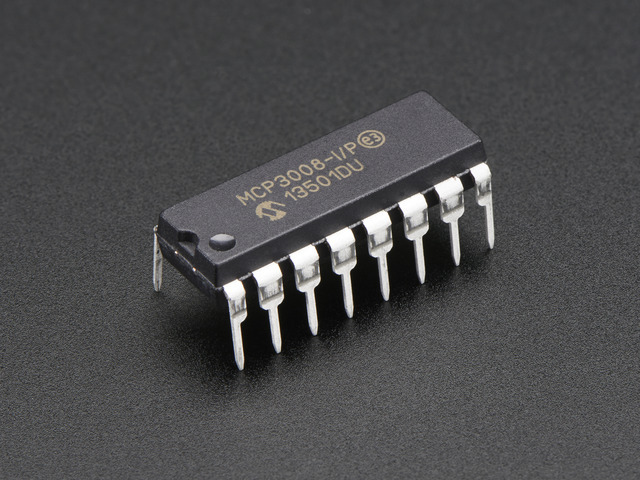 If you haven't used bare DIP chips like the MCP3008 before you want to press it into the breadboard so its legs straddle the empty channel in the middle of the breadboard. This way you can access each of the legs of the chip from the breadboard. Remember the orientation of the chip matters and you MUST have it with the half circle indentation towards the top like the diagram above! Note that you can swap the MCP3008 CLK, DOUT, DIN, and CS/SHDN pins to any other free digital GPIO pins on the Raspberry Pi. You'll just need to modify the example code to use your pins. To use hardware SPI first make sure you've enabled SPI using the raspi-config tool. Be sure to answer yes to both enabling the SPI interface and loading the SPI kernel module, then reboot the Pi. Check you can see a /dev/spidev0.0 and /dev/spidev0.1 device when you run the ls -l /dev/spi* command before continuing. After you've wired the MCP3008 to the Raspberry Pi with either the software or hardware SPI wiring you're ready to install the Adafruit MCP3008 Python library. You can install the library from the Python package index with a few commands, or you can install the library from its source on GitHub. Pick one of these options below. If you aren't sure I recommend installing from source on GitHub because it will also download examples to use the library. 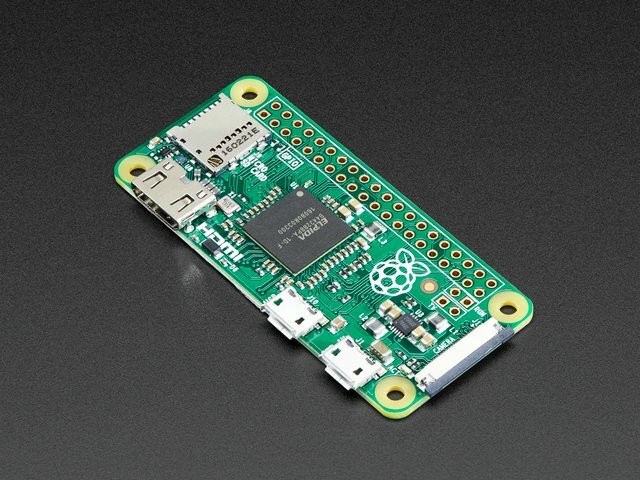 Note that before you install the library your Raspberry Pi must be connected to the internet through a wired or wireless network connection. If you see an error go back and carefully check all the previous commands were run, and that they didn't fail with an error. Note that if you install from the Python package index you won't have the example code for the library. You'll need to download these MCP3008 examples to the Pi manually and run them in the next section. Note: If you installed the library from the Python package index using the pip command you won't have the example code and will need to download it to the Pi manually. By default this section of code configures the chip to use the software SPI configuration described in the previous section. If you used different pins for your software SPI setup be sure to change the values of CLK, MISO, MOSI, CS to the pins you used. Each column represents a different channel and the header on the first row shows the channel number (from 0 to 7, 8 channels total). The value for each channel is the ADC value for that channel. This is a number that ranges from 0 to 1023, where 0 means the signal is at a ground level, and 1023 means it's at the AREF value (3.3V) or higher. In between values are proportional to each other, so a value of 512 is about 3.3 / 2 or 1.65 volts. Press Ctrl-c to stop the example. Try connecting a potentiometer to one of the analog inputs. Connect the middle leg of the potentiometer (the wiper) to an analog input, then connect one of the other legs to Pi 3.3V and the other leg to Pi ground. Run the example and twist the potentiometer around. You should see the ADC value change and get lower as the voltage from the potentiometer decreases, and get higher as the voltage increases! This line is calling the read_adc() function from the MCP3008 Python library. The function takes one parameter, the channel number to read (a value of 0 to 7). As a result the function will return the current ADC value of that channel. Reading an ADC channel in your own code is as easy as calling the read_adc() function! Pass in the channel to read and it will return the value. That's all there really is to using the MCP3008 library to read an analog value! If you're curious you can examine and run the differential.py example just like you ran simpletest.py. Modify the configuration to suite your wiring, either software or hardware SPI. Then when you run the example it will call the read_adc_difference() function and use it to read the voltage difference between channel 0 and 1 of the chip. Sometimes it's useful to read the difference of two signals to help reduce noise and other artifacts from analog signals. That's all there is to the MCP3008 Python library! This guide was first published on Feb 09, 2016. It was last updated on Feb 09, 2016. This page (MCP3008) was last updated on Apr 17, 2019.